Two Technologies JETT•XL Hand Held Computer - Two Technologies, Inc. The JETTXL has the PXA270 processor — designed specifically by Intel for low-power battery-powered devices, it utilizes an integrated system-on-a-chip microprocessor to deliver high performance (624 MHz). It features XScale RISC micro architecture with on-the-fly voltage and frequency scaling, and sophisticated power management to provide industry-leading MIPS/mW performance. In other words, it's fast, powerful, yet affordable. 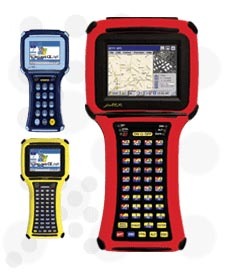 Simply the fastest most powerful, ruggedized mobile hand held computer available today. The JETTXL® has the PXA270 processor-designed specifically by Intel for low-power battery-powered devices, it utilizes an integrated system-on-a-chip microprocessor to deliver high performance (624 MHz). It features XScale RISC micro architecture with on-the-fly voltage and frequency scaling, sophisticated power management to provide industry-leading MIPS/mW performance. In other words, its fast, powerful, yet affordable. The JETTXL comes standard with both 802.11b/g and Bluetooth with technology that allows they to operate at the same time with maximum efficiency. Of course there is also standard USB and your choice of RS-232, RS-485 and RS-422 serial interfaces. If wide area networking is needed, WWAN GSM/GPRS is also optionally available. Talk to the printer, GPS, or central company database, JETTXL makes it easy.